Discussion in 'Norton Commando Motorcycles (Classic)' started by hobot, Aug 20, 2010. Is there any warnings or caveats concerning quality-brand of cam shaft drive chain to install? Nope. Acquire from any of the reputable sources. Or wait till Jim C gets his gear drive version on the market. Don't use new stock Renold camshaftchain (old stock is fine) because the rollers are no longer made of an one piece bush but rolled to a bush. To be recognized by a seam lenghtwise (sharp eyes needed). They definitely will split open in time! BTW Renold did the same to their triplex primairy chain. So you have to watch very closely before you buy! Oh Ok glad I asked, NOS search is on and when found will get two. I'll have to ask them to examine close if the vendor don't know w/o looking. Any hints on who might have NOS item? If i can afford Comstock's gear drive and it offers enough advantage for Peel deal I'd be jumping on it, but in mean time will have to fall back on standard NOS chain and tensioner, while looking at catalogs of belt drive options to have my own fabbed up. I assume Jim has already researched the best way to drive cam, so likely wasting my time to out think him here. 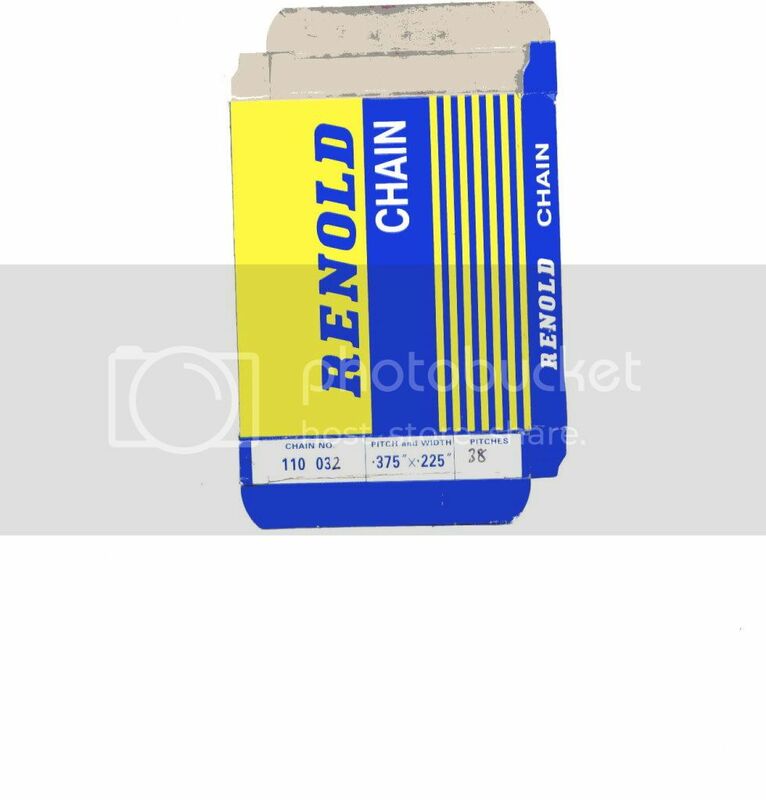 Some 5 or so years ago I bought a new "Renold" cam chain. It came in the box below. At the time I had the idea that the box was different from before. The blue colour is lighter, and I thought the old boxes had a text like "registered trademark" on them. The new one does not. Unfortunately I had no old box to check. Anyone out there who has? I think the new chain had split rollers but am not sure. Had no issues with it so far though. Original primary chain onmy bike has some rollers missing, about 4 in total, pretty cloe to each other, guess it was an original stock chain, I note the supplier I get parts from has a Tsubaki & Renolds on offer, so maybe the Tsubaki might be the best option? I got a new timing chain with the bottom end rebuild kit from Norvil. Compared to the original chain, it looked somewhat cheap. Put it on anyhow. Don't know if it is really any different, just looks different. Should have taken a picture, timing cover is on now. Any update on cam chain picks? I want a Renolds,( AN is stocking CZ) what else is out there? Modern Renold is overpriced for the quality. The new AN CZ I bought doesn't impress me much. I tried to put a new Renolds on and it had very little free play even with the shoe not touching it. I could hardly get the sprockets on and off. I put the stock chain back on and the sprockets pushed on by hand. Only reason I was going to put a new one on was due to the fact the original had a couple of tite spots. Guess I will just live with them. As already said by others, the IWIS sold by the chain man is the biz IMHO. Yes, it's good. I have a Regina chain on at the moment, it was supplied by Mick Hemmings, but I am sure other supply it. I concur, my “new” timing chain looked like such crap, I put it back in the bag, re-used the old one. That’s a good comparison Jimbo. The IWIS certainly looks more confidence inspiring to me. I used IWIS on my 850 and will have also fitted one to my 920 (currently work in progress) and I’ve no coplmaints. When I buy chain, I usually buy Japanese, because there is less likelihood of quality issues. The primary chain on my 850 is single row and was intended for use on the back of an MX bike. It cops a helluva beating.